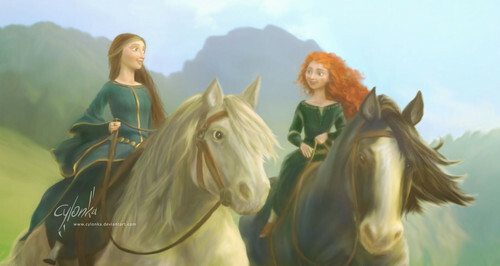 Merida and Elinor. ব্রেভ. HD Wallpaper and background images in the ডিজনি Extended Princess club tagged: photo brave merida elinor disney pixar 2012 animated film. This ডিজনি Extended Princess fan art contains lippizan, lipizzan, lippizaner, ঘোড়া কলহকারী, কলহকারী, ঘোড়ার লেজ, and horse trail.